Sometimes I'm not as prepared for Father's Day as I should be. Which is actually ok, because there are some seriously awesome gift ideas out there, so even when I don't come up with something original, I can still give an awesome gift. 1- Cupcake and brownie burgers with a side of cookie fries, with instructions and free printables from Bakerella. 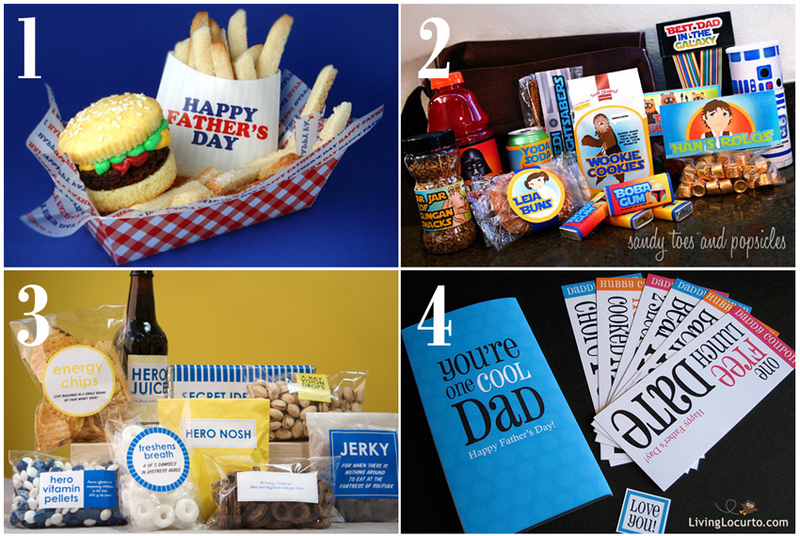 2- Father's Day Star Wars mega themed gift pack, with 12 free pages of printables from Sandy Toes and Popsicles. 3- Super Hero gift box for the super man of the family, with free printables from Jordan Ferney as posted on Alpha Mom. 4- Cool dad coupon printables with a cute way to package the gift, from Living Locurto. Now, as always, I just have to make up my mind and decide which one I'm actually going to use for Father's Day...... it's a tough call, I love them all so much.